This recipe is used for candied citrus peel of any type of citrus fruit. I almost always save the peel from any citrus used in my kitchen and then candy the peel. The peel can be frozen for later use, and the peel when candied can also be frozen for later use in its candied form. INGREDIENTS:Candies the peel of three navel oranges. 3. Spread the cooked peel onto parchment covered cookie sheet and place in the warm oven for 30 minutes. 4. Remove from the oven and let cool. 5. Cut candied strips into the size you prefer. 6. 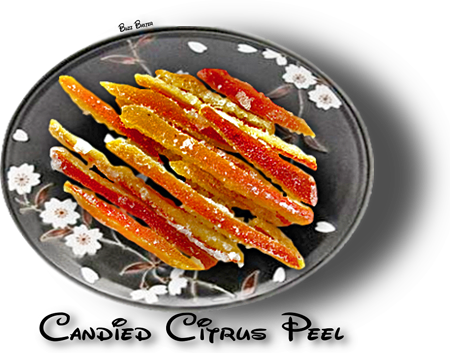 Place the candied peel in a small zip-lock® bag with the superfine sugar and coat the candied peel. 7. The peel is now ready to use or to refrigerate or freeze. 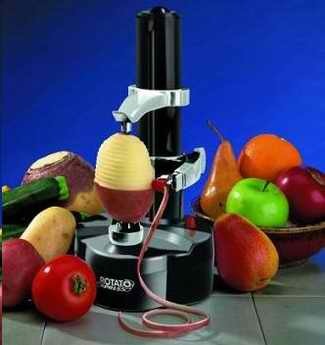 The ROTATO EXPRESS® is an electric potato peeler. The one I have will run on  electricity from a kitchen outlet, or 4 AA batteries. most fruits. It works especially well on citrus fruits,  removing the peel (zest) and not the white bitter pith beneath the skin. This great little gadget can be yours for around $25.00 at most stores and at Amazon or E-bay.